His name is Jyothi Raj (alias Kothi Raj), and locals say he is like Spiderman, climbing rock-walls quite easily without any rope support. He is an Indian free solo climber, born in the State of Tamil Nadu. 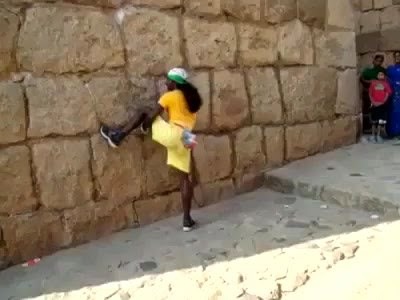 He earned himself the title Kothi Raj by climbing the tall stone structures and walls at the historically famous Chitradurga Fort, Karnataka, by allegedly copying similar techniques used by monkeys. He does not climb for sports, but to entertain the visitors to the fort.